Rohde & Schwarz demonstrated 5 GHz signal analysis bandwidth at the European Microwave Week 2017 in Nuremberg. Combined with an optional frequency range extension up to 90 GHz and the R&S®HA-Z24E external preamplifier operating from 1 GHz to 85 GHz, makes the R&S®FSW85 signal and spectrum analyzer ideal for analyzing wideband signals such as automotive radar FMCW chirp signals, IEEE 802.11ay signals and 5G waveform candidates. Rohde & Schwarz demonstrated 5G component characterization at 28 GHz at the GSMA Mobile World Congress 2017 in Barcelona. The R&S®SMW200A vector signal generator supports signal generation according to the 28 GHz pre-5G specification available at www.5gtf.org. The R&S®FSW signal and spectrum analyzer with the R&S®FSW-K18 amplifier measurement option and in combination with the R&S®SMW200A vector signal generator characterizes amplifiers and other two-port devices with any given stimulus. The stimulus can be a level-swept CW signal or any modulated signal. The amplifier personality provides all results such as AM/AM conversion, gain compression and EVM from a single measurement with the specified stimulus. Rohde & Schwarz demonstrated its leading role in 5G pre-development with three different test setups at the GSMA Mobile World Congress 2016 in Barcelona. Based on the R&S®SMW200A vector signal generator and the R&S®FSW signal and spectrum analyzer, Rohde & Schwarz demonstrated WLAN IEEE 802.11ad signal generation and analysis as an example of a broadband signal up to 2 GHz. The same instruments enable generation and analysis of 5G air interface candidates, such as UFMC, FBMC, GFDM and f-OFDM, and also provide 5G channel sounding in combination with the R&S®TS-5GCS test software. Rohde & Schwarz demonstrated a unique solution for testing wideband signals at millimeter frequencies with reduced hardware complexity, at the GSMA Mobile World Congress 2016 in Barcelona. Based on the R&S®SMW200A vector signal generator and the R&S®FSW signal and spectrum analyzer. How to use the R&S®FSW-B160R real-time spectrum analyzer from Rohde & Schwarz to troubleshoot a local WLAN signal and discover the source of interference. Rohde & Schwarz in cooperation with Fraunhofer HHI realize a novel channel sounding solution. The solution is based on flexible off-the-shelf test instruments and ready to support the ongoing 5G channel modeling work in 3GPP standardization and in various research projects worldwide. The test setup, demonstrated in this video, operates at 82.5 GHz and is based on the R&S®AFQ100A baseband generator, the R&S®SMW200A vector signal generator and the R&S®FSW signal and spectrum analyzer. 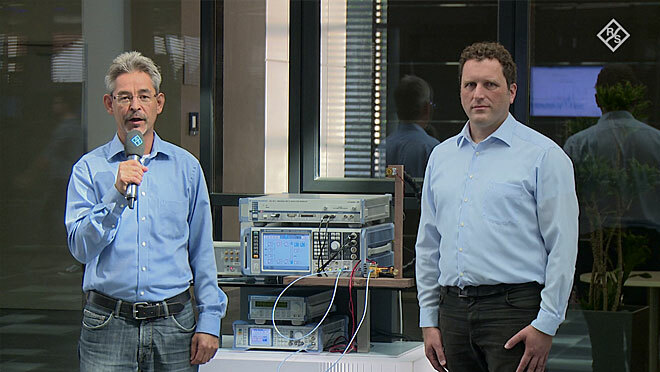 The test instruments flexibility in absolute frequency and wide bandwidth support makes this solution equally applicable for future development tasks for 5G. Explore the benefits of multistandard realtime analysis to discover erroneous signals on radar transmitter signals using the R&S®FSW signal and spectrum analyzer from Rohde & Schwarz. Simplified power amplifier (PA) characterization including envelope tracking and digital predistortion has been demonstrated by Rohde & Schwarz at the GSMA Mobile World Congress 2015 in Barcelona. The test solution is based on the R&S®SMW200A vector signal generator and the R&S®FSW signal and spectrum analyser. The R&S®SMW200A provides realtime RF and envelope signal generation plus digital predistortion in one instrument and the R&S®FSW enables full PA characterization, including EVM, gain and distortion measurements. Rohde & Schwarz demonstrated a test setup for broadband 5G applications in the millimeter wave range at the GSMA Mobile World Congress 2015 in Barcelona. The setup based on the R&S® SMW200A vector signal generator and the R&S®FSW signal and spectrum analyzer can test bandwidths up to 2 GHz, which is 100 times larger than in current LTE networks. Demonstration of basic phase noise measurements and some user interface features, as well as the I/Q mode, which are part of the R&S®FSW-K40 phase noise measurement option. The video shows how the new I/Q mode provides an important speed advantage for the user. The R&S®FSW signal and spectrum analyzer from Rohde & Schwarz sets standards in RF performance and usability. Explore fully automated FMCW signal analysis with the R&S®FSW-K60 transient analysis option from Rohde & Schwarz. The R&S®FSW signal and spectrum analyzer is ideal for FMCW radar signal analysis used for example in automotive radars, altimeters and ground surveillance radars. The video demonstrates phase-coherent pulse demodulation using the I/Q analyzer in the R&S®FSW signal and spectrum analyzer from Rohde & Schwarz. The I/Q analyzer provides capabilities for displaying amplitude and phase of the signal in time domain or in I/Q vector diagram. Offering a frequency range up to 50 GHz and 320 MHz demodulation bandwidth makes the R&S®FSW signal and spectrum analyzer from Rohde & Schwarz ideal for millimeter wave signal analysis. The video demonstrates signal analysis of a very fast and wide bandwidth pulse at 80 GHz, generated with the R&S®SMF100A microwave signal generator in combination with the R&S®SMZ frequency multiplier. Simplify measurements on differential amplifiers using the R&S®FSW signal and spectrum analyzer with the R&S®FSW-B71 analog baseband inputs option and the R&S®RT-ZD differential probe from Rohde & Schwarz. This setup enables to measure the characteristics of a differential amplifier directly at the outputs of two single-ended amplifiers eliminating the need of a balun and a complex test setup. The most versatile and easy envelope tracking test solution has been demonstrated by Rohde & Schwarz at the GSMA Mobile World Congress 2014 in Barcelona. The realtime RF and envelope signal is provided from a single instrument, the R&S®SMW200A vector signal generator. The R&S®FSW signal and spectrum analyzer measures, for example, distortion and power added efficiency (PAE). At the GSMA Mobile World Congress 2014 in Barcelona, Rohde & Schwarz demonstrated signal generation and analysis solutions for handling extremely high frequencies and/or ultrawide bandwidths. The use of mm-wave frequencies is judged to be an important 5G technology component to achieve even higher data rates and system capacity. The R&S®FSW67 high-end signal analyzer with its 67 GHz and 500 MHz of analysis bandwidth is paving the way for developers of future 5G applications with signals in the highest frequency ranges.